Two recent obituaries of persons who worked in North American comics. From D.D. 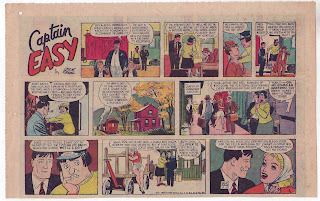 Degg comes news of the passing of Belford A. Richards, who apparently wrote the Wash Tubbs/Captain Easy comic strip during the early 1950's, when Leslie Turner was drawing it. 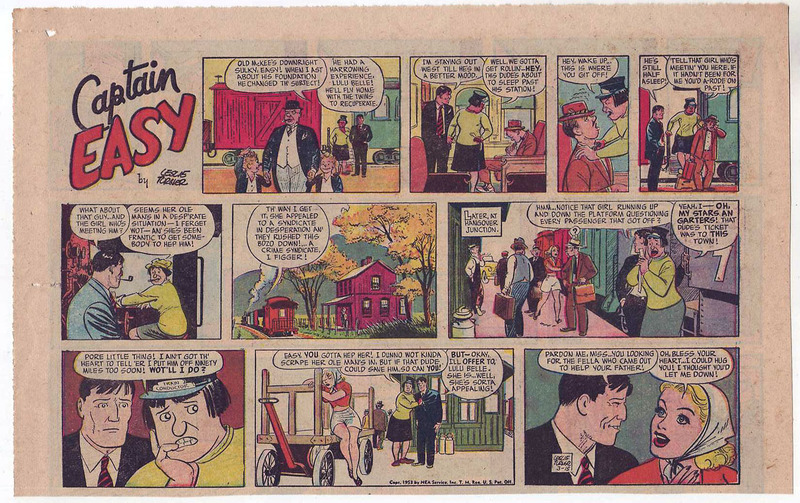 Captain Easy Sunday page for March 15 1953, drawn by Leslie Turner. ANDOVER - Belford Arlington Richards, 86, died Sunday, April 29, 2012, at Franklin Regional Hospital. He was born in South Portland, Maine, on April 25, 1926, the son of Harold Scott Richards and Aria Gould Richards. He graduated from St. Paul's School in Concord, in 1945. Joining the U.S. Marine Corps at 18 years old, Belford was one of the youngest Marines to serve during the end of World War II over the South Pacific as an aircraft radar/radio operator and tail gunner. He attended the University of MI and transferred to Rollins College, Fla., where he graduated in 1953 with a BA. While at Rollins College he wrote comic strip continuity for Les Turner, artist of the Washtub [sic] Comic Strip cartoon. Mr. Richards traveled to England in the 1950s to do research on a book he was writing called "Forty on the Emu." He returned to Portland, Maine, in 1963 and was employed in advertising and became a Freemason. In 1974, he moved to Bradford, and had resided in Andover for the past 15 years. Mr. Richards was an avid reader, collector of original comic strip art, and loved to travel, especially to the island of Gozo, Malta. He leaves behind Gail Gurnsey Richards, his wife of 25 years; two sons, Tyler Ford Richards and the Rev. Michael H. Richards; a daughter, Lizabeth McAllaster Tompkins and numerous friends in both Europe and the U.S.
Norman Fruman, a noted scholar and a longtime faculty member of the Department of English at the University of Minnesota, died of cancer on April 19 at his home in Laguna Beach, Calif. He was 88. Fruman is perhaps best known for his 1971 book, "Coleridge, the Damaged Archangel," which exposed a pattern of plagiarism by beloved English poet and literary critic Samuel Taylor Coleridge. 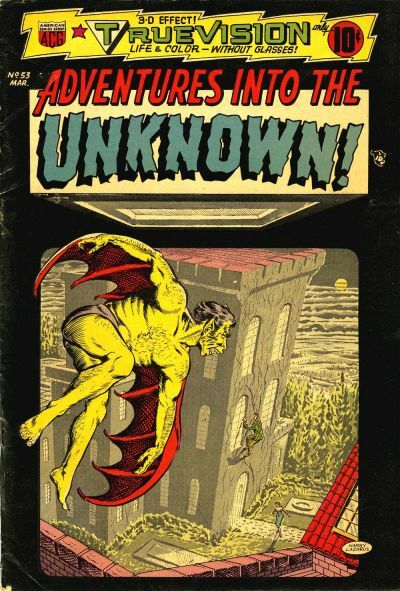 Cover to Adventures into the Unknown #53 (March 1954). Art by Harry Lazarus. According to Jerry Bails's Who's Who, Fruman was an assistant editor for ACG between 1951 and 1955, where he also wrote stories for titles such as Adventures into the Unknown. He's also credited with having written "about 700 scripts" for Better Publications during that decade.